We encourage all our pupils to have a cooked school meal which are provided at a cost of £2.30 per day. They are prepared on the premises by our friendly and helpful kitchen staff. There is a three week rotating menu (see below). If there is to be any change in the menu, we will let you know via the weekly school newsletter. Dinner money is payable in advance on a Monday via the ParentPay website. Pupils may bring a packed lunch although we do encourage you to consider hot lunches. One week's notice is required if you intend changing your child from school dinners to packed lunches, or vice-versa, as food is ordered in advance. Hot lunches may be purchased for part weeks, booked in advance. 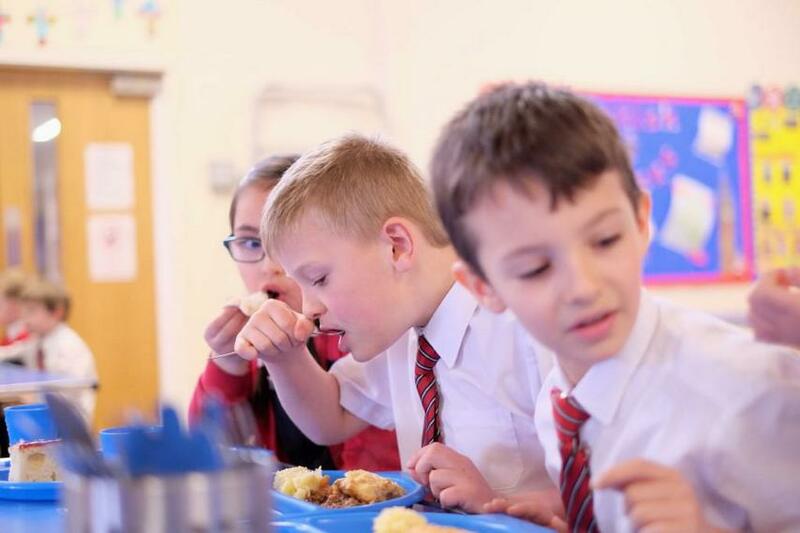 Enquiries regarding eligibility for free school meals may be made by telephoning 0161 474 3878 or calling in at one of the local Information Centres. Our team of lunchtime organisers care for the children at lunchtime. All Foundation Stage and Key Stage 1 children are offered a piece of fruit daily for morning break at no charge. If parents wish, they may send in a piece of fruit for their child to have at breaktime. Key Stage 2 children eat this at morning break whilst the younger children have this in the afternoon. We also offer the option of purchasing a slice of toast each day for a snack. A charge of 25p per day is payable half-termly via ParentPay and must be paid by the first day of the half-term. The Cool Milk scheme operates in school. If you wish your child to receive milk during their morning break (or afternoon in the afternoon Nursery class) you will need to register with Cool Milk at www.coolmilk.com . There is no charge for under 5's but there is a variable charge for children from 5 years of age upwards.